5793 labyrinths found. Showing 41-60. Sorted by country, state, city, then zip/postal code. 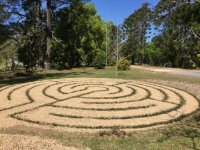 All Saints Anglican Church is set amidst 2 acres of beautiful trees and gardens, and is the perfect setting for a prayer labyrinth. 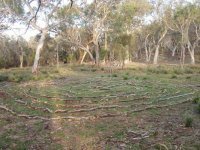 The labyrinth is located at Koora Retreat 435 km east of Perth and 160 km west of Kalgoorlie, 2 km east of the State Barrier Fence, north of Great Eastern Highway in Boorabbin National Park, Western Australia. You can see it on the Koora Retreat facebook page or book a walk on our website. 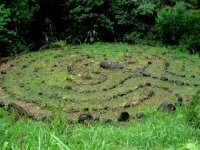 All scheduled retreats offered on the website can include labyrinth walks. 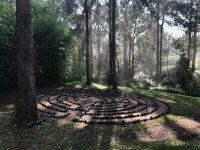 All scheduled retreats offered on the website can include labyrinth walks. Chartres, eleven-path/circuit replica including rose and lunations. S 31.26040° Lat. ; E 120.02174° Long. 27 2.873S° Lat. ; 153 9.224E° Long. The Cathedral is open from 9.30am to 4.30pm every day and visitors are welcome to walk the labyrinth during these times. Note that google maps and GPS will take you the long way through rough country, so ring first for directions or see our website. Please note that access to the property is via a dirt road. 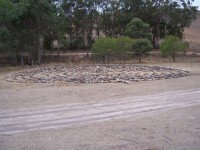 The labyrinth sits on the lake bed of Lake George - a traditional meeting place for local Indigenous peoples. 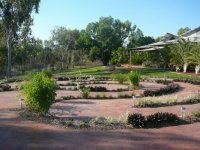 It is a ruggedly beautiful, serene spot with abundant wildlife including kangaroos, galahs, cockatoos, rosellas and king parrots. Please wear long pants and covered shoes as the wildlife also includes the occasional snake. Individuals and groups welcome. 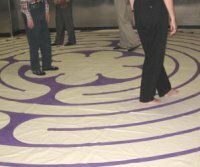 Labyrinth facilitators, please contact the Director if you would like to use the labyrinth for an event. 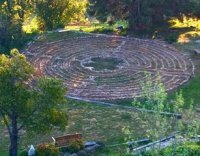 We would love to see the labyrinth used for worldwide labyrinth day! Please contact the Director, Catherine to arrange a visit and for directions. This is a permanent structure, based on the classic design with 5 circuits, set in the grounds of the Church, with easy access to the community. Kerever Park Spirituality Centre was owned and operated by the Religious Women of the Sacred Heart (Kincoppal-Rose Bay) until closed in 2010. 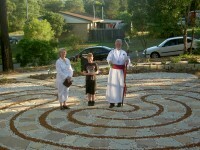 Labyrinth was constructed mid-2008 as project for 2008 World Youth Day. Site is on southern side of property adjacent to and a few metres in from Hurlingham Avenue. Property was sold in 2014 to private buyer. For enquiries re access: contact WM Carpenter & Associates, Bowral NSW (attn. Bill Carpenter, email: bill@wmcarpenter.com.au). For enquiries re access: contact WM Carpenter & Associates, Bowral NSW (attn. Bill Carpenter, email: bill@wmcarpenter.com.au). On the first Sunday of the month from 2-4pm. Visitors welcome, but please contact the owner before entering the garden. It remains permanent while walkers tend to its maintenance. It was created initially with branches but, after eighteen months of diligent work, includes rocks and stones which run more or less parallel with the branches. The kangaroos and echidnas disturb their alignment from time to time. "Five Senses" is not easy to find without a guide. 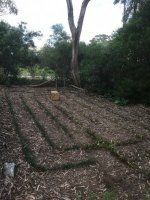 Over time, more and more people have walked and maintained the labyrinth. Its walkers and maintainers have either been taken there by others or simply discovered it while walking through the reserve. Go to the carpark on the corner of Phillip Avenue and Kellaway Avenue, Hackett. Follow the Old Tip Track (Access Summit), which starts off at the iron barrier gates (the extension of Phillip Avenue). After about 500m (going south) you travel under powerlines and then through a locked gate. Continue up quite steeply another 250m (travelling south-east), then the track flattens out a little, and curves to the south-west around the top of a gully, before turning south-east again. At the bend, look to your right (west) for a grassy clearning, with a faint track in. Five Senses is about 50m in, under a large old eucalypt with a protruding brown growth. Once located, you can explore the other possible tracks to get to Five Senses. 35 deg. 15' 47.° Lat. ; 149 deg. 9' 44.° Long. 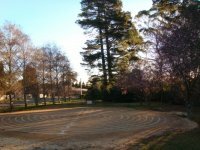 The labyrinth on the day of installation. Updates and details are on the Ecobotanica website. Available on the second Thursday of each month from 2.00pm until 6.00pm or by appointment. Corner of Kennedy St. & Forest St.
36.48.04° Lat. ; 245.46.06 ° Long. Based on Cretan style, but modified for use by frail and elderly people with wheelchair accessability. We are 35 mins from Lismore, 25 from Kyogle and 45 from Murwillumbah. Please ring for directions and to check availability. 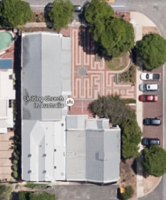 Please note that walking the labyrinth under the influence of drugs or alcohol is not allowed. Thank you. By appointment only, please ring first to confirm availability with owners.